The monument honoring Dorence Atwater, Plymouth’s Civil War hero, is on a hill overlooking Baldwin Park on Main Street in the Terryville section of Plymouth. 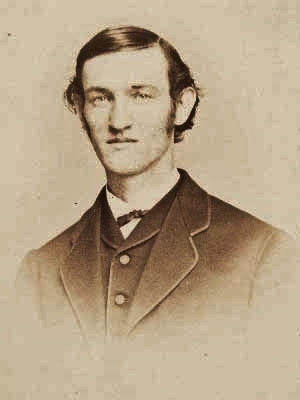 In 1861, Atwater enlisted in the Union Army at the age of 16, was captured in July, 1863, and sent to the notorious Confederate prisoner of war camp at Andersonville, Georgia in February, 1864. While there, he was concerned that the identities of the dead would not be provided to their families, so he secretly kept a list of the 13,000 Union soldiers who died in captivity. 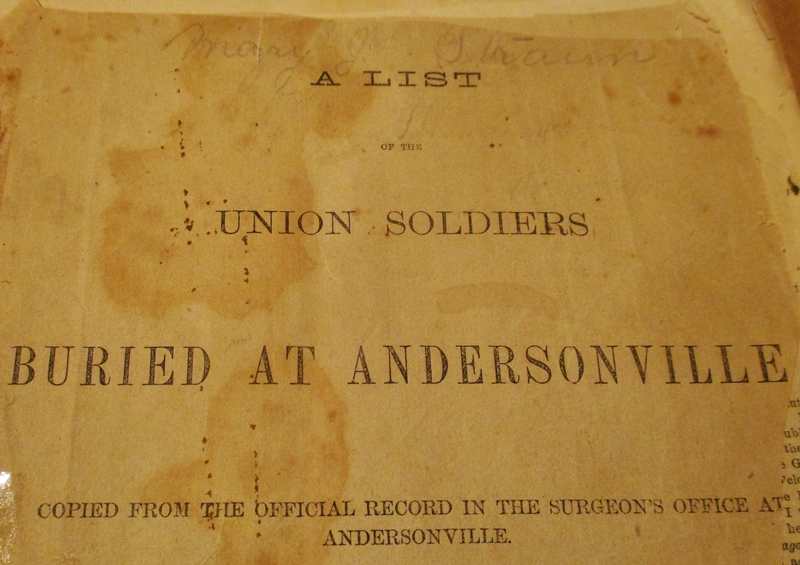 When he was released from Andersonville, he smuggled out his list. 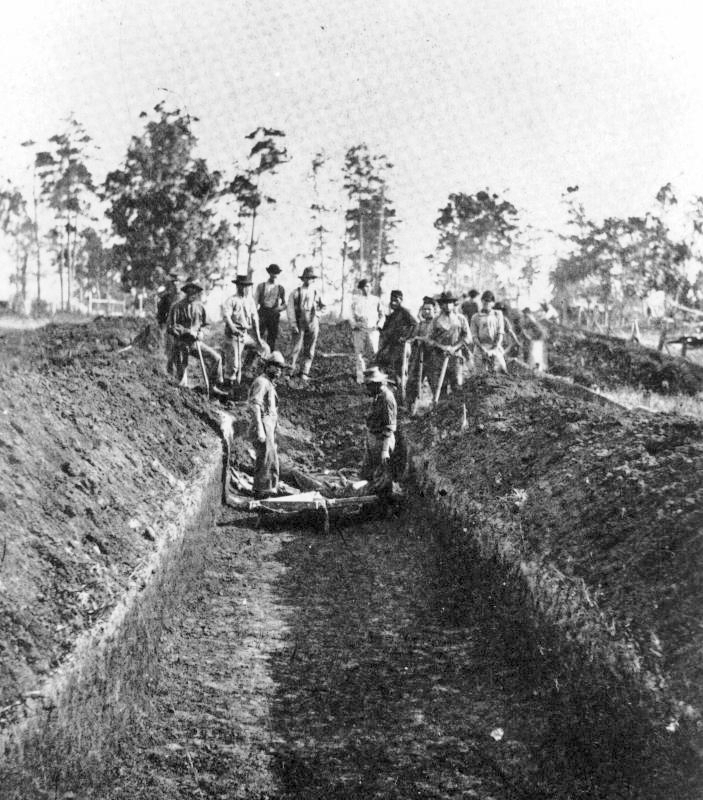 After the War, he returned to the prison with Clara Barton, (who later founded the American Red Cross), and properly identified the dead soldier’s graves. Because of his efforts, the families and friends of the missing soldiers were able to learn the fate of their loved ones. He was rewarded by being named the American consul to the Seychelle Islands, later became ambassador to Tahiti, and married a Polynesian princess, Moetia Salmon. He became a successful businessman, owning a shipping line, a pearl business, and a vanilla bean plantation. He was also friends with Robert Louis Stevenson, who used Atwater for a character in one of his books, The Ebb-Tide, which took place in Tahiti. 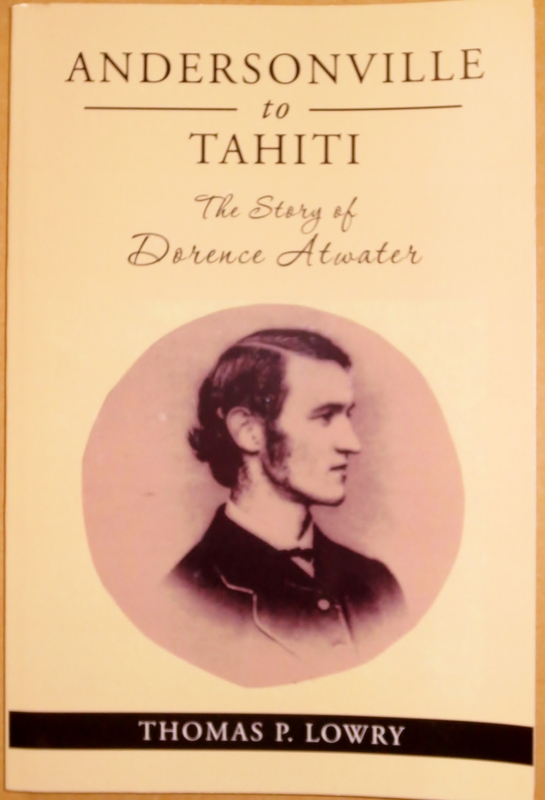 In the book, the character of “Attwater” is a successful pearl trader, a business that Dorence Atwater was also in. The Terryville Library has a copy of the book that can be taken out. 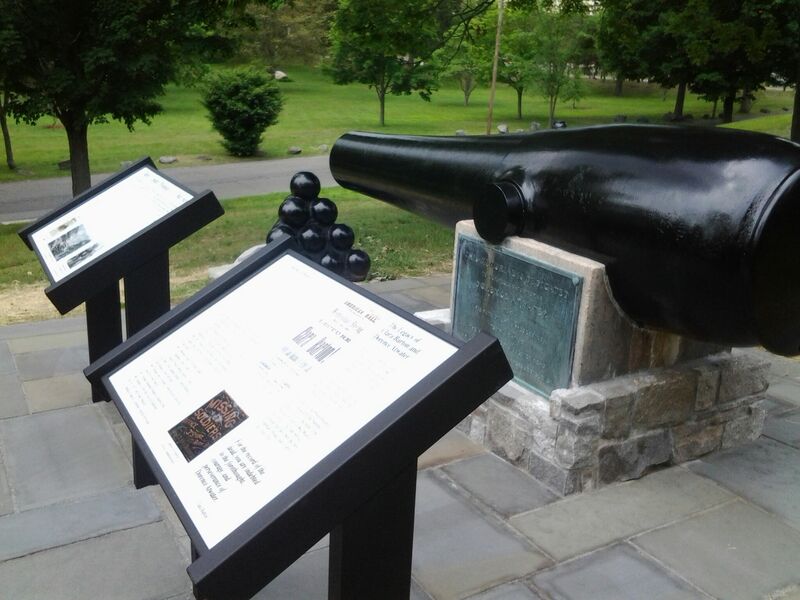 On Memorial Day, 1907, the monument, consisting of a plaque and cannon, was dedicated, with Clara Barton in attendance. Atwater returned to Terryville in 1908 to see the monument. He died in 1910 in San Francisco, and is buried in Tahiti. To commemorate the 150th anniversary of Dorence Atwater’s return to Plymouth in 1865, the Historical Society held a celebration on May 30, 2015 at Baldwin Park on Main St. in Terryville. 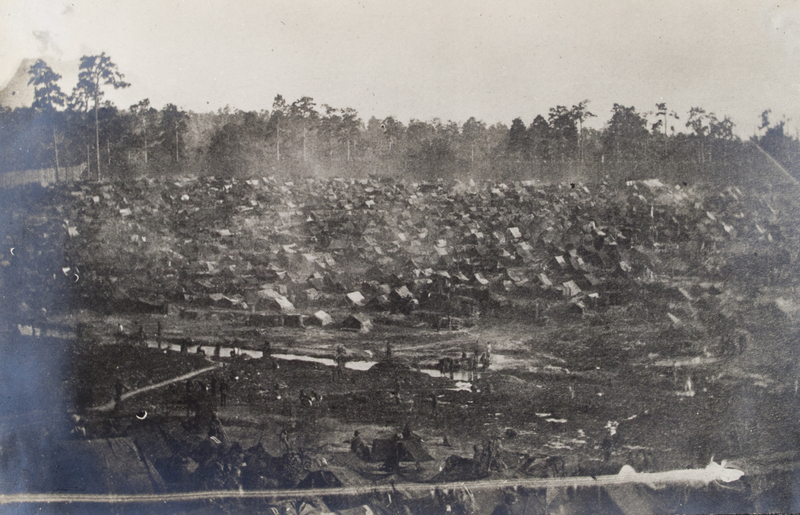 Painting of Andersonville prison camp by Thomas O’Dea, who was a prisoner. The painting was done after the War. 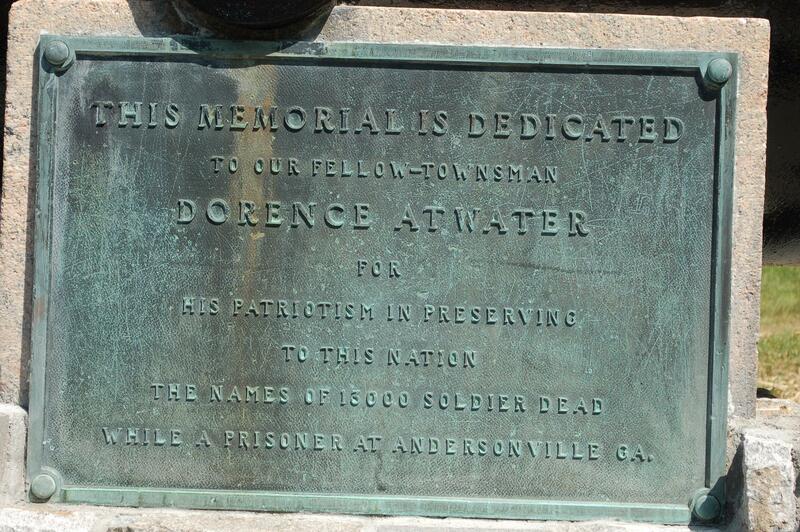 Atwater’s mother died two months before he was captured. We don’t know if he knew of her death. His father died shortly after he returned home from the War. .The birthplace of Dorence Atwater is at 192 South Eagle Street, Terryville. It is a private residence. 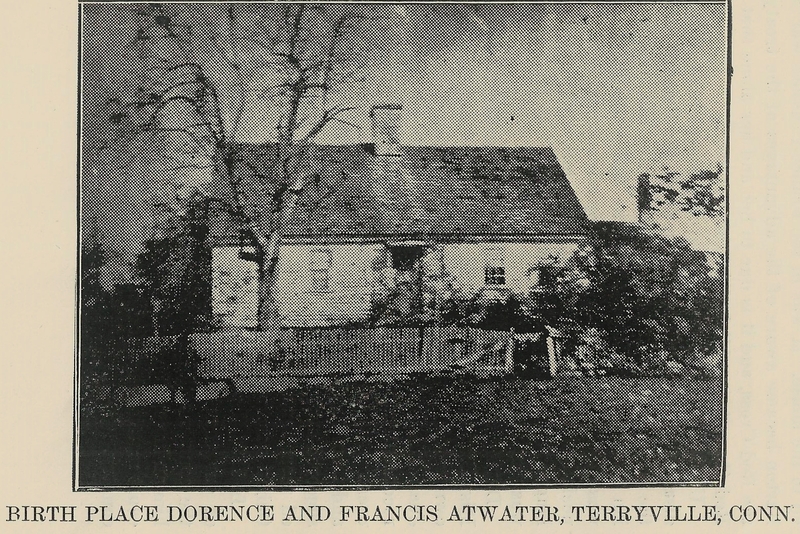 The photograph is from the the Memoirs of Francis Atwater, Dorence’s younger brother. The memoirs were donated to the Society by Chris Foard. 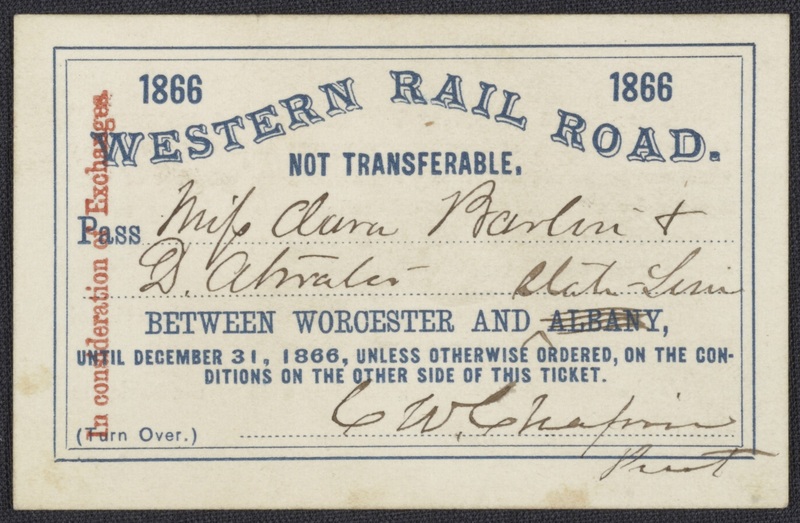 Railroad Pass for Clara Barton and Dorence Atwater. Courtesy US General Services Administration and Library of Congress. .After the War, Atwater and Barton went on a speaking tour to raise awareness of their mission to locate the missing soldiers. They were issued free passes from various railroads to travel to their engagements. 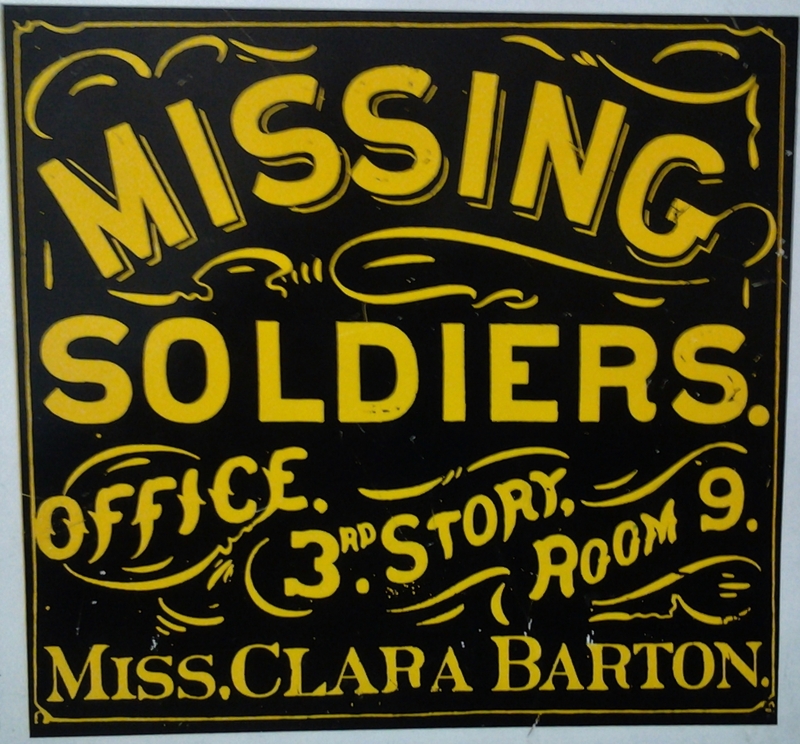 .In 1865, Clara Barton organized the Missing Soldiers Office in Washington, D.C. to provide information to the 60,000 families who tried to find out what happened to their loved ones who were missing in action. Atwater assisted Barton in this endeavor, and with the help of the 13,000 names on his list, they were able to account for 20,000 Union soldiers. Atwater and Barton lived in the boarding house where the Missing Soldiers Office was located. One of the legacies of Dorence Atwater and Clara Barton is that there was a much more concerted effort to learn the whereabouts of American MIAs in subsequent wars, including better means of identifying soldiers, such as wearing dogtags. 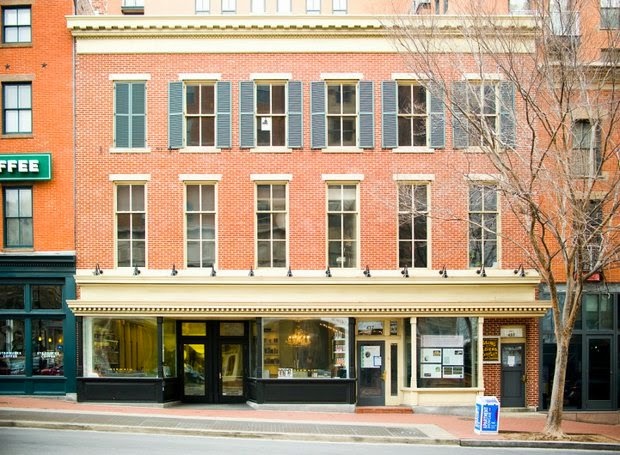 The Clara Barton Missing Soldiers Office Museum is at 437 7th St. NW in Washington, D.C. The Missing Soldiers Office in Washington DC. Dorence Atwater and Clara Barton rented rooms on the third floor. Image courtesy of Stefan Hurray. 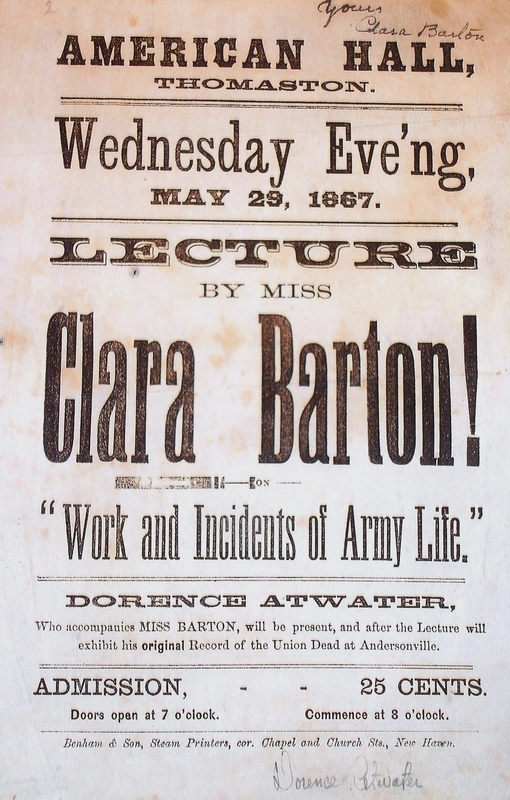 This poster advertising a speech by Clara Barton and Dorence Atwater is from the collection of Chris Foard. The “American Hall” was the first brick building in Thomaston, CT. It is on Main Street, and is now occupied by the law offices of Seabourne and Malley.
. 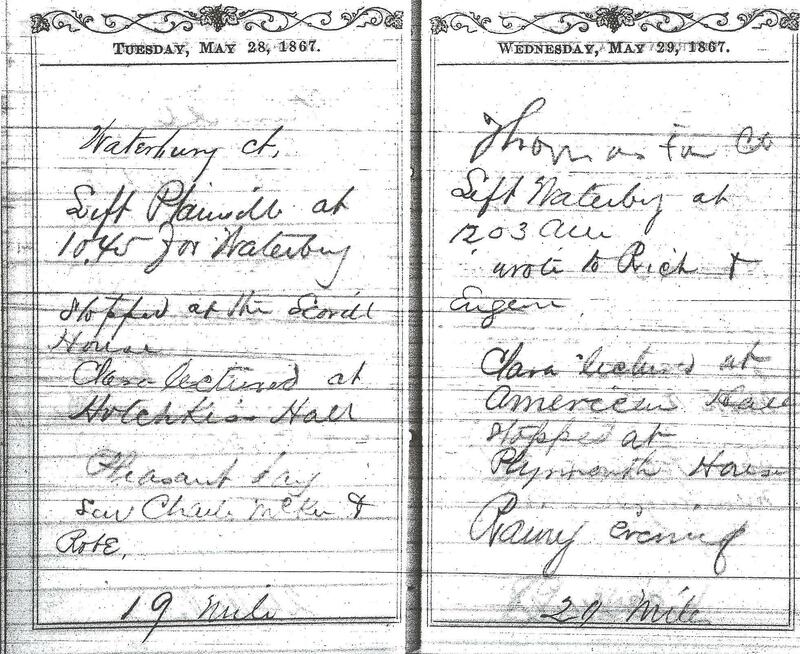 This entry from the diary of Dorence Atwater indicates that he and Clara Barton gave a speech at the Hotchkiss Hall in Waterbury, CT on May 28, 1867, then traveled to Thomaston, CT to give a speech on May 29. It mentions that they “stopped at Plymouth House”, presumably Atwater’s family home. Atwater also gave speeches on his own. 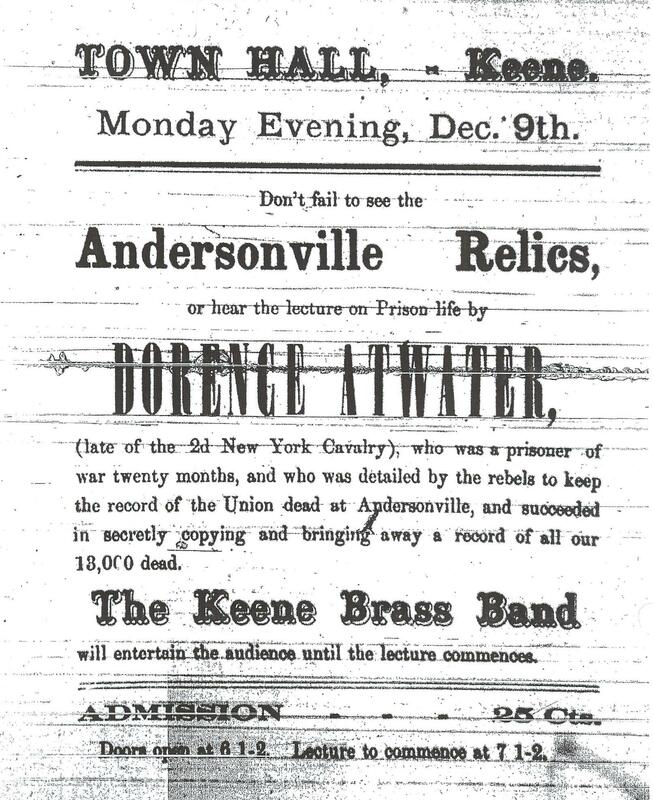 Poster for Dorence Atwater speech in Keene, N.H. We are indebted to Chris Foard, who has a passion for nursing history. He discovered Atwater’s diaries and the poster for this lecture at the Library of Congress. He has generously provided these images to the Historical Society. .Moetia Atwater was the daughter of a British banker, Alexander Salmon, and Ari’itaimai, granddaughter of the former King of Tahiti. She was educated in Europe. 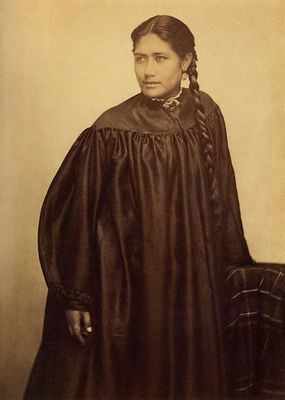 This photograph is probably from her graduation. She lived from 1848-1935. 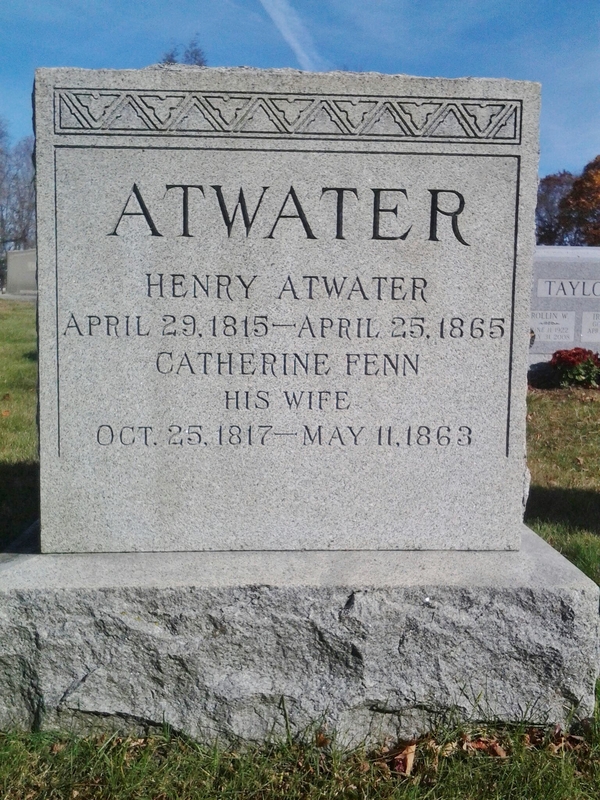 She was married to Atwater in 1875 until his death in 1910. She accompanied Atwater when he returned to Terryville in 1908. 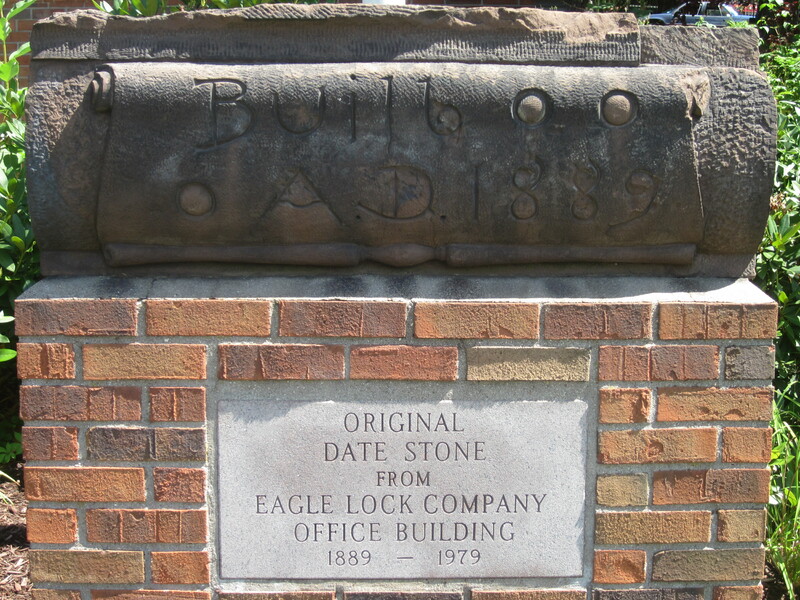 The Lock Museum of America is at 230 Main Street, across the street from the original location of the Eagle Lock factory, founded in 1854. It has been featured in many travel guides for those seeking unusual sites off the beaten path. The Eagle Lock Room contains over 1,000 locks and keys manufactured from 1854 to 1954. The Bank Lock Room comprises a selection of bank locks, vault locks, safe locks and time locks. The Corbin-Russwin Room contains a large display of ornate hardware. Several pieces are gold plated and enameled. One of the animated displays shows how a pin tumbler lock works. A large display of mounted door knobs and escutcheons made by Russwin and P & F Corbin during the Victorian era are extensively detailed in styles such as Roman, Greek, French and Italian Renaissance, Gothic, Flemish, and Elizabethan English. The Yale Room accommodates locks manufactured from 1860 to 1950. One of the attractions here is the original patent model of the Mortise Cylinder Pin Tumbler Lock designed by Linus Yale Jr., in 1865. While this device is considered the greatest invention in the history of lockmaking, it is certainly not without historical precedent. Close by is a 4,000-year old Egyptian pin tumbler lock! The Antique Lock Room contains a large display of colonial locks and Ornate European Locks dating to the 1500s. There is also a handcuff collection! The museum is a fascinating look at the technology used over the centuries to “keep honest people honest”. 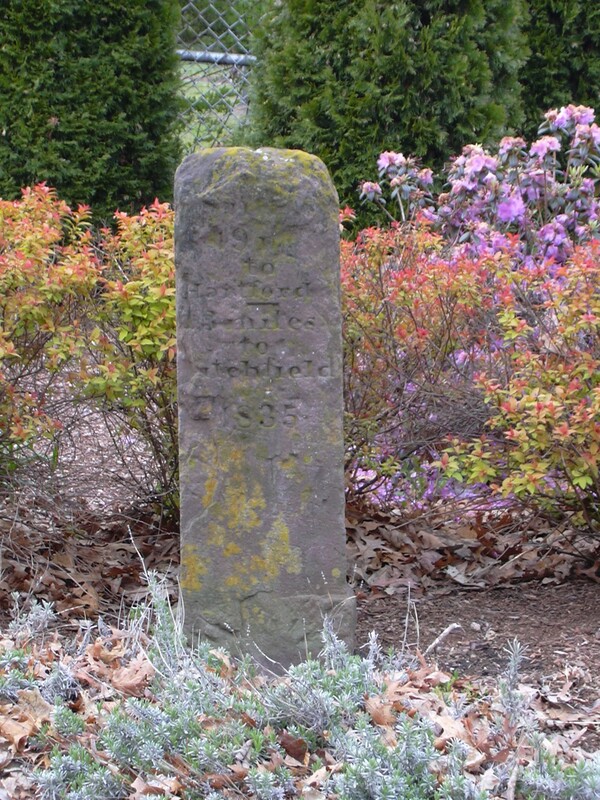 The date of 1835 is confusing as other records state that the marker was placed in 1815, just a few years after the incorporation of the Town of Plymouth in 1795. This particular marker has been allotted a special place in Plymouth with respect to its place in our history. As you can see from the photo, the town has graciously landscaped around this historical remnant of the early days of Plymouth and our nation. 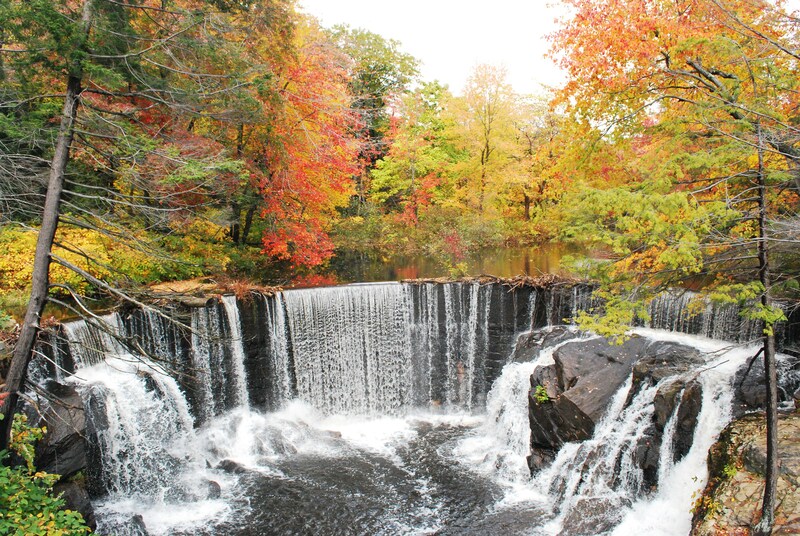 In 1851, Eli Terry built a dam on the Pequabuck River to supply water power for a new factory, the Terryville Manufacturing Company. Located on Canal Street, the shop made clocks and clock parts. 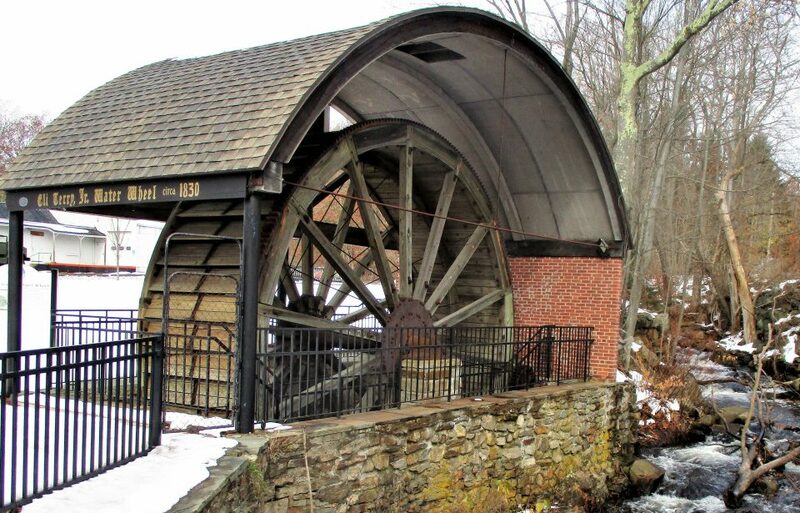 Water from the pond was diverted down a canal to turn a water wheel that generated 35 horsepower at full speed. In 1864, the factory became the Eagle Bit and Buckle Company, manufacturers of harness bits and buckles for the Union Army during the Civil War. Eventually, locks for mailbag pouches were made here. Later a sawmill occupied the site, and by 1908, it was a woodturning plant (Charles Allen Woodturning) that made handles for all sorts of carpentry tools, such as braces, files, and mallets. They also made gavels and wooden spigots for barrels, furniture knobs, and even the wooden flagpoles for PT Boats that served in the South Pacific in World War II. A waterwheel powered the shop until 1913 when it was replaced by an electric motor. The bridge on Canal Street that provides this view of the Falls is named after Ted Knight, who starred in ” The Mary Tyler Moore Show” in the 1970s and in the popular film “Caddyshack”. He grew up on nearby Allen Street. The section of Plymouth known as Greystone is in the southern part of town, located near Hancock Dam. 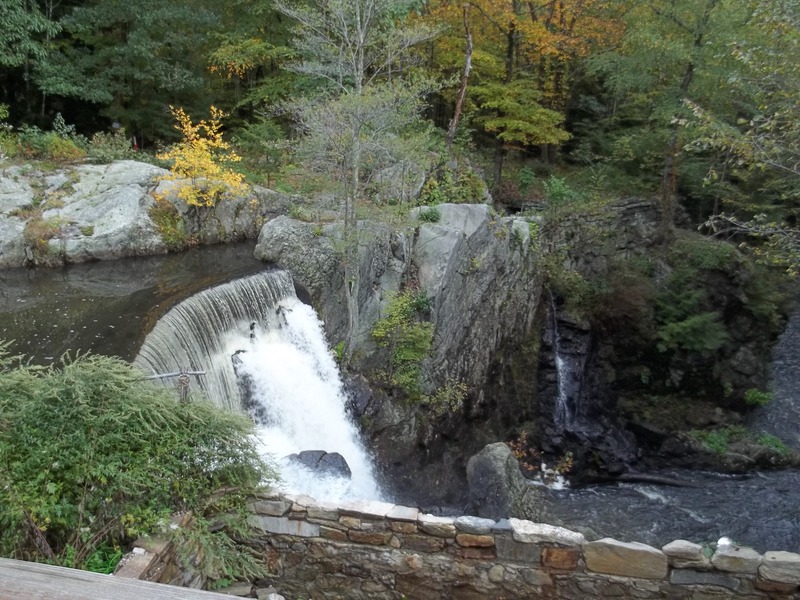 In the 1700s, enterprising folks built dams to harness the power of Hancock Brook to power a sawmill, a grist mill, and most importantly, the Clock Factory owned by Eli Terry, Seth Thomas, and Silas Hoadley. The Old Cemetery at the corner of South Main Street and Agney Avenue in downtown Terryville has the gravestones of many individuals and families associated with the clock and lock industry that contributed to Plymouth’s history. 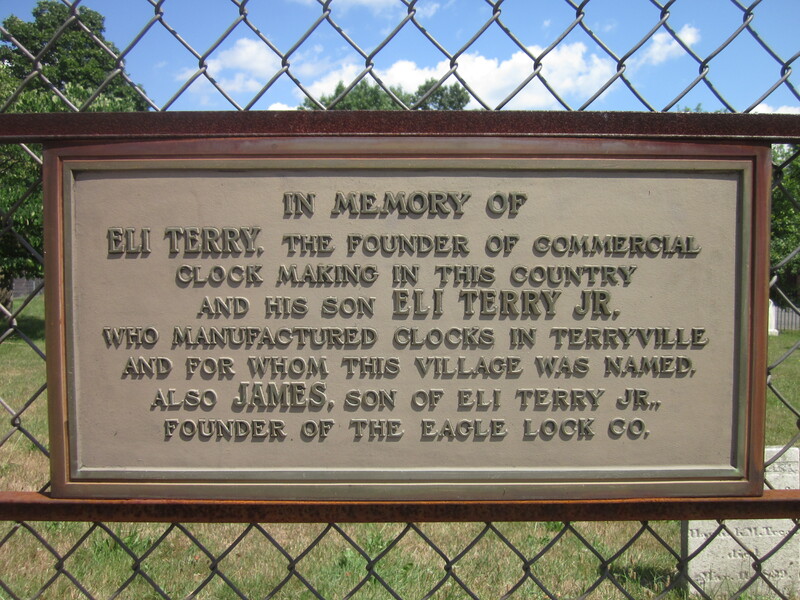 For example, famous clockmakers Eli Terry and his son, Eli Terry, Jr., for whom Terryville is named, are buried here, as is Hiram Welton, a clockmaker who took over Eli Terry, Jr’s business after his premature death. 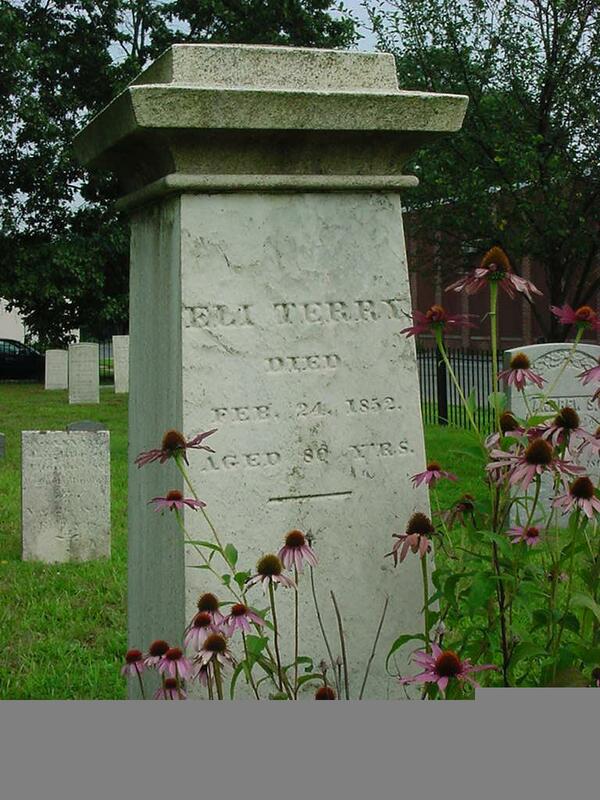 Eli Terry, Sr. is buried next to his second wife, Harriet, whom he married in 1840 after his first wife, Eunice, died in 1839. Eunice is buried in the Plymouth Burying Ground.Many individuals associated with the Eagle Lock Company and the Water Wheel are also buried here, such as James Terry, grandson of Eli Terry and son of Eli Terry, Jr., who created the Eagle Lock Company. Front of the restored James Terry monument, installed in May of 2016. 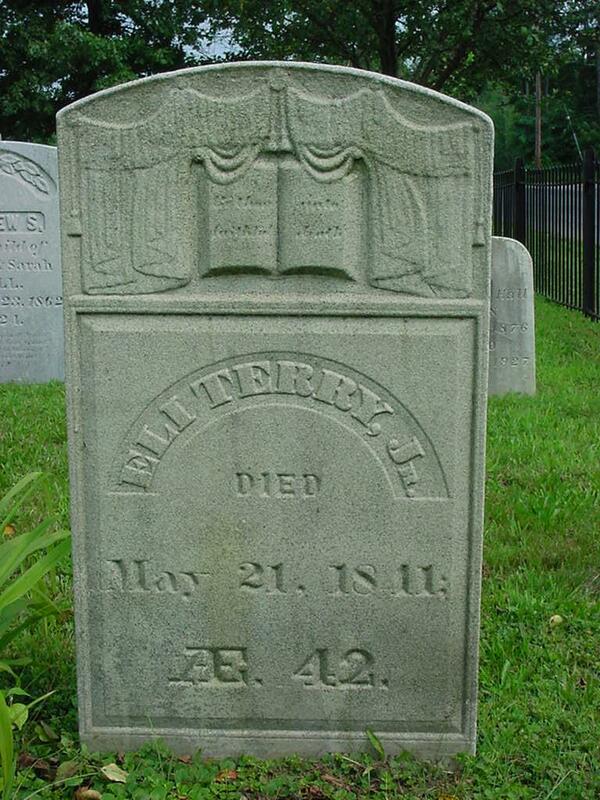 An important step in the Old Terryville Cemetery project was the installation of the restored James Terry monument. Looks like new! On October 8, 2016, the new fence at the Old Terryville Cemetery was unveiled. The project was truly a community effort. Boy Scouts from Troop 75 painted the old fence. Walt Lassy and Rit Caron fabricated the new sections of fence and installed it in the front of the cemetery along South Main Street.